Knee joint pain or Knee Osteoarthritis affects millions of people globally. Knee joint pain is a term applied to a number of painful symptoms that arise in the knee area. They can relate to a number of different disorders, diseases, or less-severe things like inflammation and bruising. If the knee joint suffers pain, the individual affected may have difficulty bending their legs. What are possible knee pain causes? There are a number of causes responsible for the pain of the knee joint. They are ultimately going to be related to either your bones, the cartilage surrounding these, your muscles, ligaments, or tendons. When this occurs, joints become difficult to move with intense pain. This makes the movement of the joints and the connected areas extremely difficult or uncomfortable. ​This can be caused by simply overusing the joint. Every joint can take strain, but if you put too much strain on a particular joint, it will begin to hurt. This is your body telling you to give it a rest! People who care their bodies on a regular basis may notice, as they begin to grow old, that they can no longer put the same amount of stress on their joints as they could when they were younger. The frequency of knee joint pain is somewhat more common among women than with men. About fifteen to twenty percent of men, of all ages, are known to have knee joint pain. The issue is far less frequent in children, with statistics averaging around 4%. Children are much less likely to develop knee joint pain, but the problem begins to become more prevalent in adolescence. 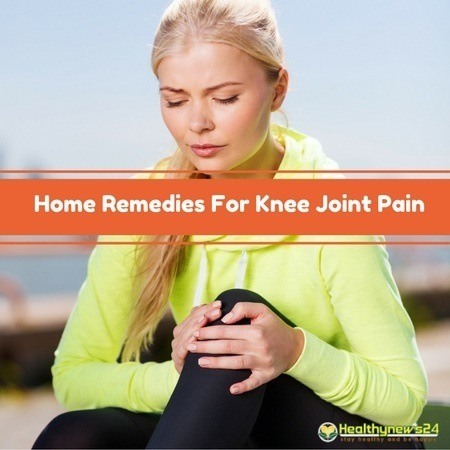 Do home remedies work to get rid of knee joint pain? Since home remedies are not medically sanctioned, they often originate without medical basis. ​However, home remedies are known to be effective because of anecdotal evidence. Anecdotal evidence differs from scientific evidence in that it is not formally tested, and instead is passed on through word of mouth. However, the home remedies listed here have become so popular that they were considered to have enough potential to be targeted by scientific research. Most of these home remedies have, indeed, been studied by science. The most readily available dietary source of bromelain is pineapple. This is also one of the best knee pain remedies due to following reasons. Since bromelain can be used to prevent muscle soreness, and it’s good at stopping inflammation, it’s very useful for those whose knee joint pain is caused by over-exerting themselves through exercise. There are two primary components of fish oil that fig﻿ht against joint pain. They are both omega-3 fats - the first is DHA (docosahexaenoic acid) and the second is EPA (eicosapentaenoic acid). Lavender, in particular, can be useful in preventing the symptoms of joint pain, including that caused by arthritis. Yoga is a millennia-old practice that has been shown, again and again, to be effective at stopping the pain. Not only does yoga prevent pain, but it can stop your bones and joints from degenerating to the point that they cause pain. A proper yoga routine involves understanding of breathing techniques, weight distribution, and balance. Ginger is a potent healing herb that can be prescribed for practically any ailment. Today, we’re looking at its effects as an anti-inflammatory painkiller. It can easily help you get rid of pain caused by arthritis. Often, arthritis and other painful joint conditions, are caused by a lack of nutrition and proper care. If you consume greens on the regular, you allow your body a chance to restore a healthy balance of minerals and nutrients. Something as innocent as performing an exercise routine on a daily basis can damage you if you don’t have enough nutrients in your body. Holy basil and green tea can cure a whole bunch of diseases. Calcium is hugely responsible for the development of healthy bones and joints. Unbeknown to many, high blood pressure can be responsible for painful joints. ​This makes it difficult for nutrients, like calcium, to be transported to your bones and joints. This can lead to a particular type of joint damage known as rheumatoid arthritis. Fortunately, controlling your blood pressure can be as simple as eating a healthier diet. Eat foods with a low glycemic index, like vegetables. It can be simple to prevent yourself from suffering knee joint pain - even with home remedies. While there are a lot of different causes responsible for knee joint pain, one of these remedies will certainly be effective. Good luck curing your knees!